Michael Essien is returning to Chelsea after a knee injury ruled him out of the rest of the African Nations Cup. 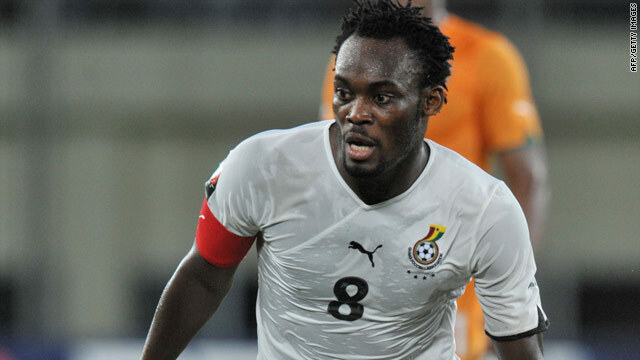 (CNN) -- Chelsea have confirmed that Michael Essien is out of the African Nations Cup with a knee injury. The English Premier League leaders are expecting the Ghana midfielder to return later this week to their training ground, where the club's own medical staff will assess the state of his injury. Ghana's team doctor has already claimed Essien, 27, will be out of action for at least a month after suffering the injury in training. Scans on Essien's left leg in Luanda are understood to have shown that he has suffered a partially torn medial collateral ligament in his knee and damage to his meniscus. A spokesperson for Chelsea confirmed: "We are aware of the injury to Michael and have been in contact with the Ghanaian team. But if his injury is as bad as first feared, then Essien is likely to miss Chelsea's Premier League encounter with Arsenal at Stamford Bridge and the opening leg of their Champions League tie against Inter Milan. Essien was taken to hospital in an ambulance and underwent a scan in Luanda on Sunday and Chelsea will send the midfielder for further scans when he returns to London this week.